The official name of this puzzle is the OTTO WU 7-Color Magic Puzzle. It consists of a ball with six grooves running from pole to pole. In its solved position each track contains 5 sliding pieces of one colour, one of the poles has a single piece of a seventh colour, and the other pole has a gap. The pieces can slide into the gap, and so get mixed up. Unfortunately the sliding pieces are hexagonal instead of round, so they can be difficult to move as they often get caught when moving from a pole into one of the six tracks. The leaflet that comes with the puzzle maintains that because each tile has little bumps on them and thus massages the palms of your hands, it will stimulate their meridian points and therefore be good for the health of your whole body. It also claims that the rainbow colours and in particular the single green tile symbolise nature and so promotes the importance of environmentalism awareness. Apparently there is also a magnet inside the puzzle. It was patented by Otto Wu from Taiwan on 14 February 1995, US 5,389,063. 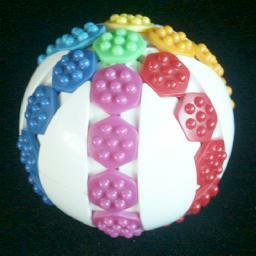 There is also a different type of massage ball which has square pieces and no gap. That version has its own Massage Ball 2 page. This leaves 32!/(2·6!·5!6) = 61,195,822,841,187,530,496 = 6.1·1019 positions. Hold the puzzle so that the tracks run up and down, meeting at the top at the North pole, and at the bottom at the South pole. The North pole will generally be empty, and the South pole will have a piece in it. Moves on the puzzle will always be a movement of one track upwards, taking with it the South pole piece, and then a move of another track downwards with the North pole piece. Phase 1: Solve 4 of the tracks. Choose a track you want to solve, and the colour you want to use there. Find a piece of that colour in another track. 1. Move any unsolved track upwards. 2. Move the track with the piece downwards. 3. Repeat 1-2 until the piece lies at the South pole. Move the track you are solving upwards, and any unsolved track down. This has placed the piece onto the right track. Repeat steps b-d until the track you have chosen is solved. Repeat steps a-d until four tracks have been solved. Phase 2: Solve the South pole. Move the solitary green piece to the South pole. See step 1c. Phase 3: Solve the last 2 tracks. Lets call the two unsolved tracks A and B, and one of the solved tracks C.
Find a piece in track A and a piece in track B that need to be swapped. 1. Move C up, A down, until the piece in A lies next to the South pole. 2. Move C up, B down, until the piece in B lies next to the South pole. 3. Move C up, B down; C up, A down; B up, C down; A up, C down. This step swaps the two pieces. It also swaps the top two pieces of track C, but that is not visible. 4. Move B up, C down, until track B has no more pieces from track C.
5. Move A up, C down, until track A has no more pieces from track C.
1. Move A up, C down, until the piece in A lies next to the North pole. 2. Move B up, C down, until the piece in B lies next to the North pole. 3. Move B up; C down, A up; B down, C up; A down. 4. Move C up, B down, until track B has no more pieces from track C.
5. Move C up, A down, until track A has no more pieces from track C.
Note that you can also do this same sequence by moving C up, turning the puzzle upside down and doing the sequence b1-5. Afterwards, turn the puzzle back and move C down again. 1. Move A up, B down, which puts the two pieces at the top of track B. 2. Move A up, C down, A up, C down, which puts two identical pieces next to the South pole in tracks A and C.
3. Move B up, C down; B up, A down; C up, B down; A up, B down. This is essentially the same sequence as step b3. 4. Move C up, A down, C up, A down. 5. Move B up, A down. To swap all pieces from tracks A and B, simply move A up and B down until they are swapped. This also moves the green piece to the other pole. 1. Move C up, to put aside the green piece. 2. Move A down, B up until all the A and B pieces have swapped. The South pole now has a C piece on it. 3. Move C up, A down, B up, A down, B up. You now have identical pieces at the top of A and B, and want to swap the bottom two pieces of C.
4. Move C down, B up, C down, A up, B down, C up, A down, C up. This is similar to steps 3.b3 and 3.c3. 5. Move B down, A up, B down, A up, C down.